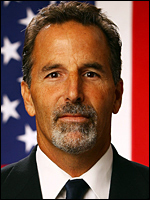 After a lengthy campaign that lasted literally dozens of hours, John Tortorella was elected the first President of the United States of Hockey by a wide margin. Brian Burke put on a late surge that raised concern in the Tortorella camp, but in the end the New York Rangers head coach had too much grassroots support. Tortorella received a stunning 30 percent of the popular vote. The next closest competitor was Burke who collected 21 percent of the electorate. It was an interesting day of watching the polls. Early exit polling showed Mike Eruzione jumping out to a seemingly commanding lead, but as the older crowd went back to their Grand Slam Breakfast at Denny’s, the election winds were a changin’. Thanks to heavy social media support, Patrick Kane was an early favorite, rapidly rising up the charts. Even Chris Chelios, with the full support of the Chicago political machine and former Detroit mayor Kwame Kilpatrick, made a mid-afternoon push, while Mike Modano and Tim Thomas never really got in the race. Tortorella was not to be denied however after getting the full endorsement of the SNY Rangers Blog. That really turned the tide of the election as the Get out the Vote campaign made all the difference. By 3 p.m. EST, this thing was pretty much in the bag for Tortorella, with Burke and Kane making last-ditch gasps. President-elect Tortorella was not immediately available for comment, but he is expected to have none. This entry was posted in NHL, Whimsy. Bookmark the permalink. Great fun–thanks for doing this.